It’s a question that, quite rightly, creates a lot of debate. Answers range from the philosophical (to provide the parameters for everyday behavior for citizens and to protect them from outside interference) to the flippant (“None!”). But one of the easily agreed upon “correct” answers is that, when it’s working as it should, government should be protecting the rights of citizens. That’s one of its formal purposes. But what do citizens actually want from their government? Again – it’s a question whose answers run the gamut from frustrated (“Get out of my way!”) to sincere (“Shorten emergency room wait times.”). However, we can probably all agree on this: government should make citizens’ lives better. Government services should measurably improve people’s lives, and the way citizens are asked to engage with those services should fit smoothly into their lives. If services are easy to access, more people, the hope is, will use them and benefit from them. If it is easy to engage with government, people will be more likely to engage. Voter turnout in Canada peaked in the 1958 federal election, with 79.4 per cent of eligible voters casting a ballot. This is despite the fact the country had already gone to the polls just nine months earlier. 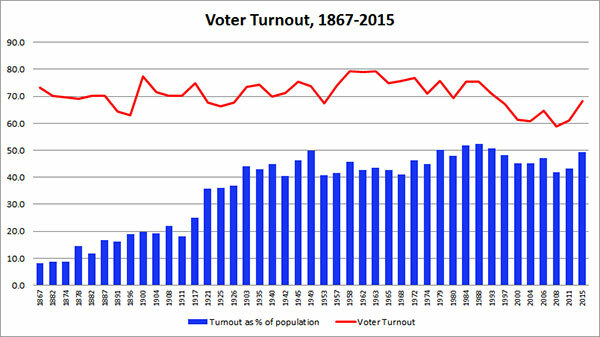 In fact, since the beginning of the 20th century, Canadian voter turnout hovered in the low 70 per cent range, with a few dips into the high 60s. Unsurprisingly, the highest voter turnout (mid 70s) was seen during the Second World War and on into the early 1960s (mid 70s). Trends remained more than respectable through the 1980s, with nearly three-quarters of eligible Canadians casting their votes in three elections. But since the early 1990s, voter turnout has steadily plummeted, with 2008 seeing the lowest voter turnout on record in Canada (58.8 per cent). The 2015 federal election saw just 68 per cent of voters turn up at the polls, although this was a noted increase over the previous decade. Making people’s live better often involves making them easier. This is where government often gets a bad rap: citizens encounter long wait times, red tape, and a seemingly endless pile of paperwork. It just doesn’t jive with the reality people live in: an always on, always connected environment. In 2014, 55 per cent of Canadians owned smartphones. In 2015, that number was 68 per cent. A 24 per cent increase in just one year.1 By mid-2016, one study pegged Canadian smartphone ownership at 76 per cent.2 Smartphones go with us everywhere. Walking the dog, dining out, on our nightstand. We’ve never been so easily connected to each other. So if government wants to remain relevant, it needs to catch up. Businesses have been adapting to this uber-connected populace faster because their livelihood depends on customers buying from them. If the customer isn’t happy, they’ll go somewhere else. If they can’t get what they want from Company X with the click of a button, they’ll go to Company Y. 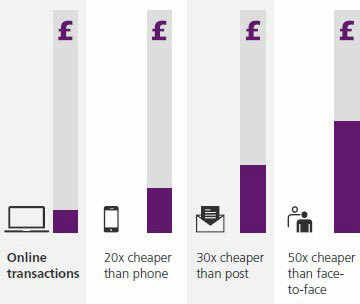 Going digital has also increased internal efficiency and cut costs. Why can’t government adopt the same mindset to make change faster? Being digital isn’t a new and shiny thing anymore. It’s not novel or ground-breaking. It’s what citizens expect. Now, this isn’t about arguing that governments should go digital for the sake of it. Being digital isn’t a new and shiny thing anymore. It’s not novel or ground-breaking. It’s what citizens expect. What is Shaping Citizen Expectations? Customer expectations aren’t shaped in a vacuum. People’s experiences as customers bleed into their expectations of government. Their expectations of government are shaped by a myriad of interactions: buying a new car, getting customer service through Twitter, using a mobile app to send flowers to a friend in another country. With billions of dollars for research and development at their disposal, Google, Apple, Amazon, and their ilk are shaping Canadians’ expectations of the service level and technologies they expect from their governments. So – What Do Citizens Expect? We’re no longer satisfied with one-size-fits-all service. Citizens want services tailored to their preferences and needs. 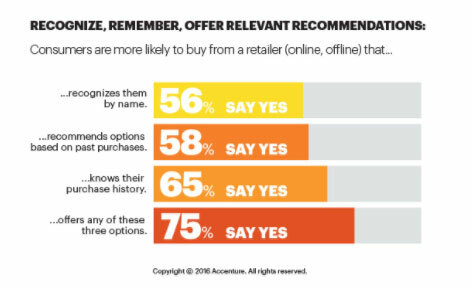 According to recent research from Accenture Interactive, 75% of consumers are more likely to buy from a retailer that remembers and recognizes them by name and can make relevant recommendations. As smartphone ownership increases, so does app use. 85 per cent of Canadian smartphone owners using a banking app and 50 per cent say it’s their primary method of depositing cheques. Wearables, while lagging significantly behind phones in terms of ownership, are a growing area. And now, with people accessing their smartphones more than 150 times a day and their smart watches 80 plus times a day,3 all technology needs to be built with these platforms in mind. If government services aren’t being delivered in a mobile-friendly way, they’re not meeting the needs of Canadians. We want proactive service. We want to be informed if something is changing or its status in the process. In our digital world this is easy to automate. Amazon automatically emails you when an order has shipped. So why not get an email when your FOIPOP request has been put in the mail? Water disruption due to pipes being replaced on your street? A text two days in advance would be handy. 65% of consumers said they feel really good about both the company and themselves when they are able to answer a question or solve a problem without having to talk with a customer service agent. And Generation Y, who will soon account for more households in Canada than Baby Boomers4, particularly favour to self-serve options. Social media has opened up a whole new world of customer service platforms and Generation Y uses social media daily. They regularly rate social media as one of the least frustrating forms of customer service. Government would do well to remember the old marketing adage of “go where your audience is”. Is it more complicated than setting up a 1-800 number? Sure. Is it the way people want to engage with you? Absolutely. People are looking for the easiest and fastest way to solve their problems. No one wants to fill out forms in triplicate, mail or fax them, wait six to eight weeks, and then find out they didn’t complete a section of a form correctly and have to start all over again. This is another area where corporations are making major strides. Need that special My Little Pony toy for a birthday party on Friday? Amazon Prime will have it at your door in 48 hours. Want to watch a movie on your Apple TV? You can buy it in a single click with Apple’s 1-Click. Tools like this make taking care of mundane tasks easier and faster. Who doesn’t want that? Government is making some progress in this area: the CRA’s My Account is a good example, allowing citizens to consolidate and access all their correspondence with the CRA in one place. But there’s a ways to go before government services will rate alongside what private companies can offer. At the core, what are citizens really asking for? They want the touchpoints they have with their government made better. They want them to be useful, easy, fast, personal, and safe. It’s a tall order, but it is doable. For an excellent example of a government that is delivering services in the digital forms citizens want, look no further than Estonia. Estonia has established itself as a world leader in digital government, offering e-residency, online voting, tax returns linked to both the tax office and local banks, and more. Every Estonian now has a digital ID, and typically carry just one or two government cards – drivers’ licenses, health cards, donor cards, and more have been rolled into one. Many even do their banking through their government ID card. Now, if a task or service can be completed digitally, it is. Like in Estonia, transforming Canada’s government services from traditional to digital won’t happen instantaneously. Már Másson Maack at The Next Web writes compellingly about the hesitations government wrestle with when it comes to modernizing their approach. Digital security and the threat of malicious hacking are top of mind and all too real. But we need to remember that the principles of good digital government aren’t changing. And the need for government services to be delivered digitally will only increase. We need government to provide digital services that are safe, fast, easy, personal, and useful. So let’s get started. As T4G Kick’s Agency Director, Oliver is passionate about the intersection of marketing and technology, creating compelling customer journeys that captivate consumers and build brands. In his spare time, you’ll find him on the water, on the hill skiing with his boys, or planning his next alpine getaway in his second home – Austria.